After a few days at Viseu de Sus we now had the opportunity to see one of the forestry railway networks that almost completely vanished in the early years of the 21st century. 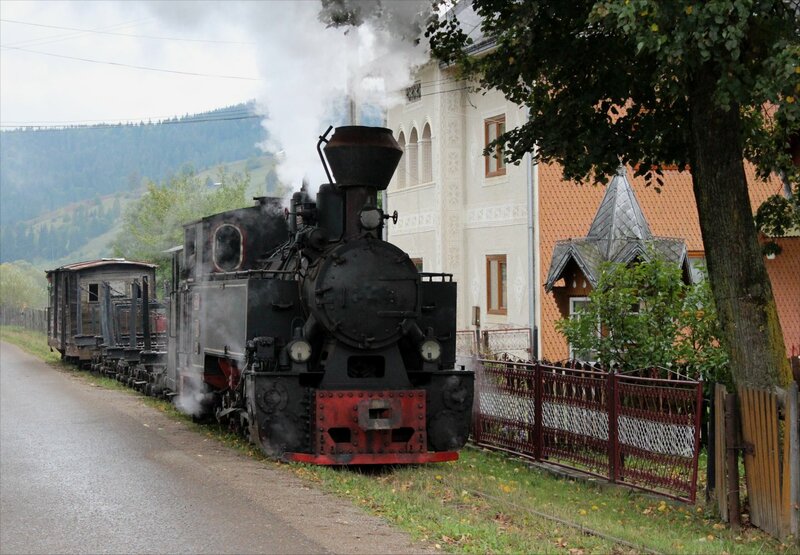 The line at Moldoviţa was opened in 1888 but only converted to the present gauge of 760 mm in 1909. At its greatest extent, just before the revolution, it covered an impressive 73 km. 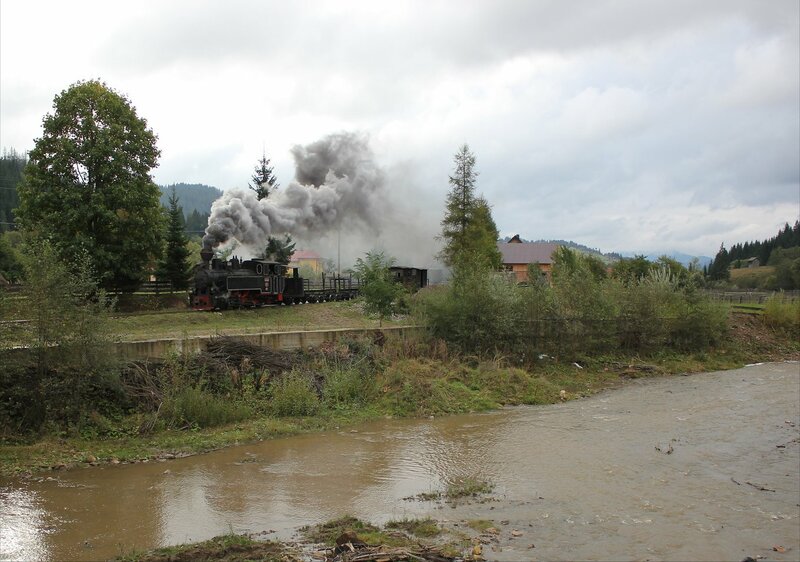 Today, the restored line between Moldoviţa and Argel accounts for 12km of the former track. 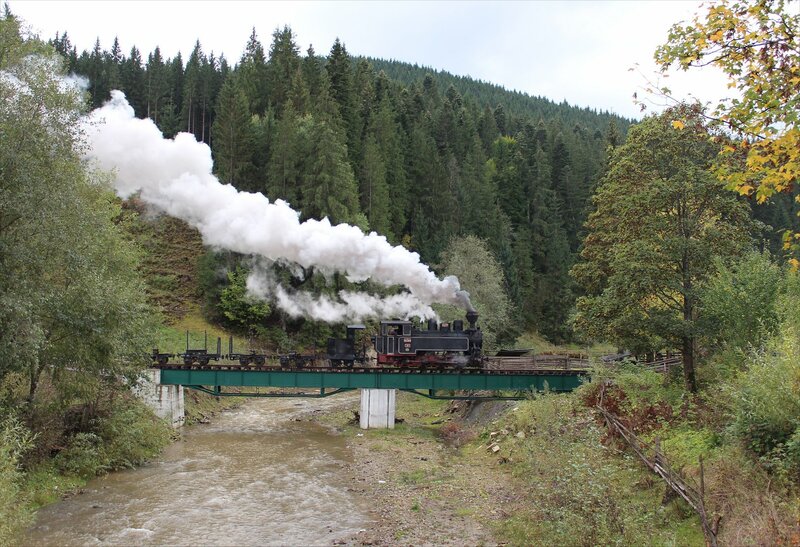 A look at a map of the original network centred on Moldoviţa shows how those 73km were achieved, with an impressive number of branches reaching into the Roșoșa river valley and the forests of Bucovina. 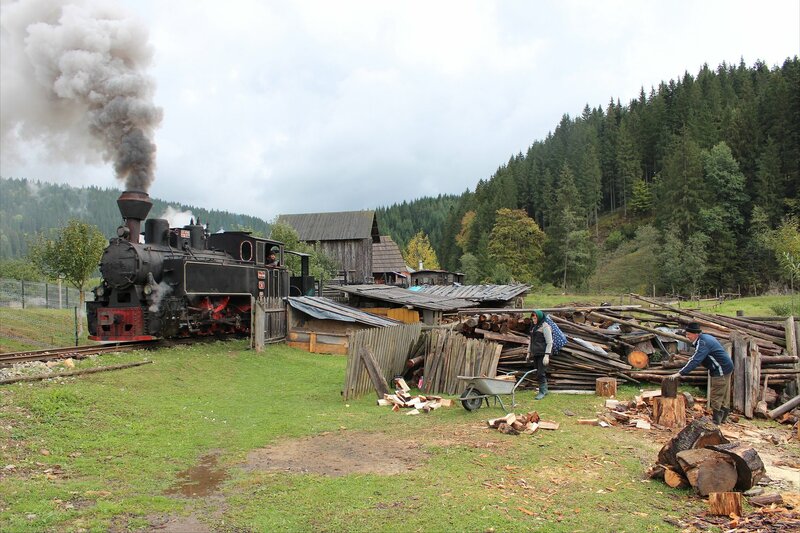 However, the decision of the state forest service to switch to heavy lorries for the transport of timber proved devastating, not just for the railway but also the communities that had grown to depend upon it. The line was almost completely abandoned and things looked quite bleak for a time. 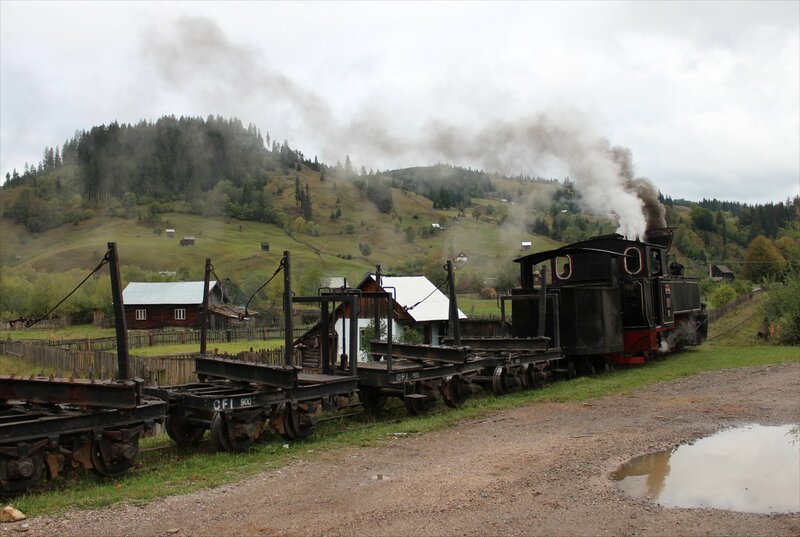 However, the past ten years have seen quite a turnaround with the time and money committed by Georg Hocevar, the owner of the railway workshop of CFI (CALEA Ferata Ingusta) and undoubted saviour of Romania’s narrow gauge heritage. 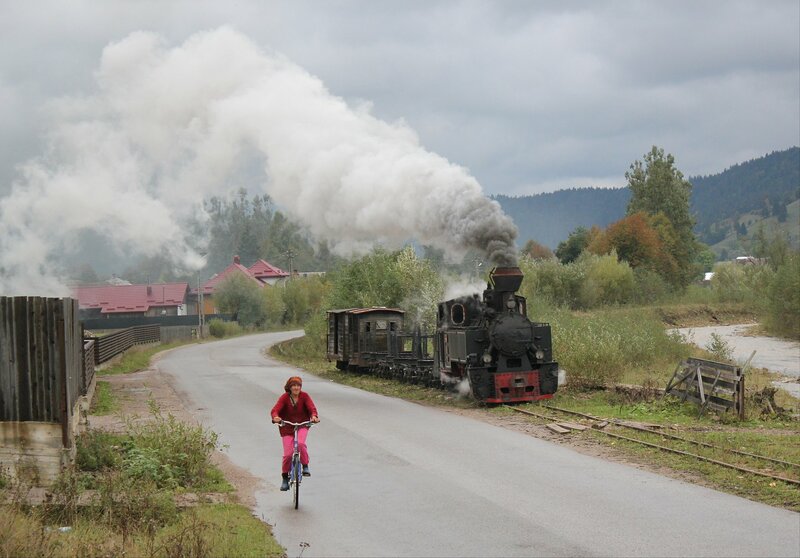 The progress in this time is striking – progressing from 3.5km of track in 2005 to around 12km in late 2013 with the extension of the line into the village of Argel (requiring an expensive bridge over the Moldoviţa river). 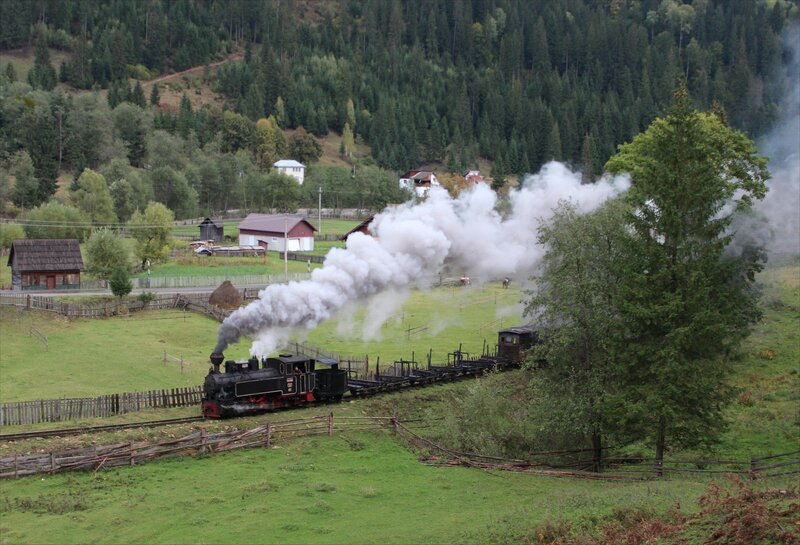 Although the line of today cannot match what came before, it is still very impressive and presents a quite beautiful setting for a railway. 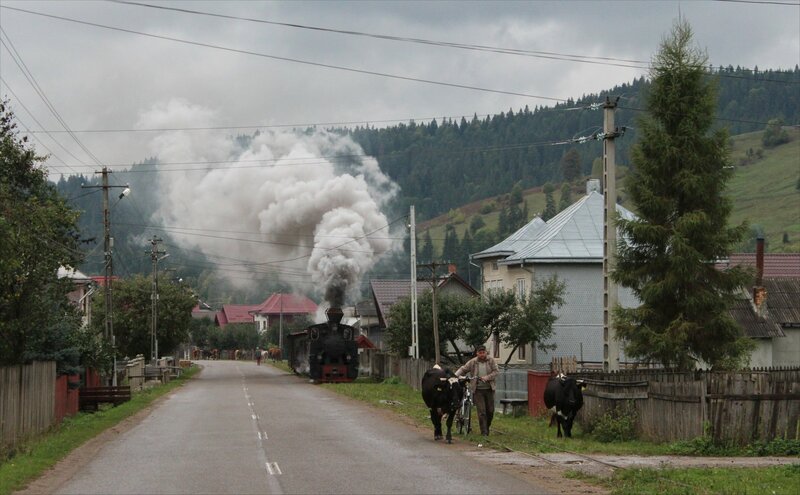 In many ways, I preferred this line over the railway at Vișeu de Sus as it seemed to have so much on offer, from street running with cattle through to great vantage points from which to watch a train steaming through the valley. 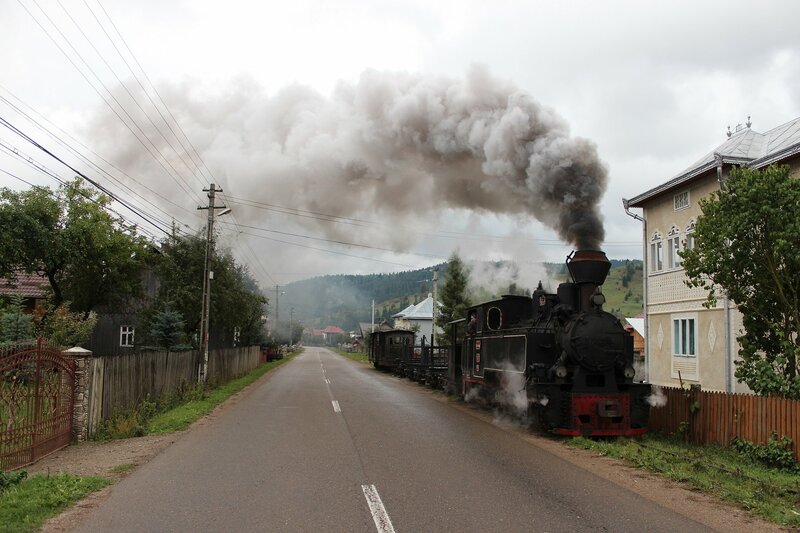 Our day on the line saw us use 764-404R (Reghin, 1984) to haul a photo-freight with logging trucks and a couple of cosy vans at the back for us to travel in. 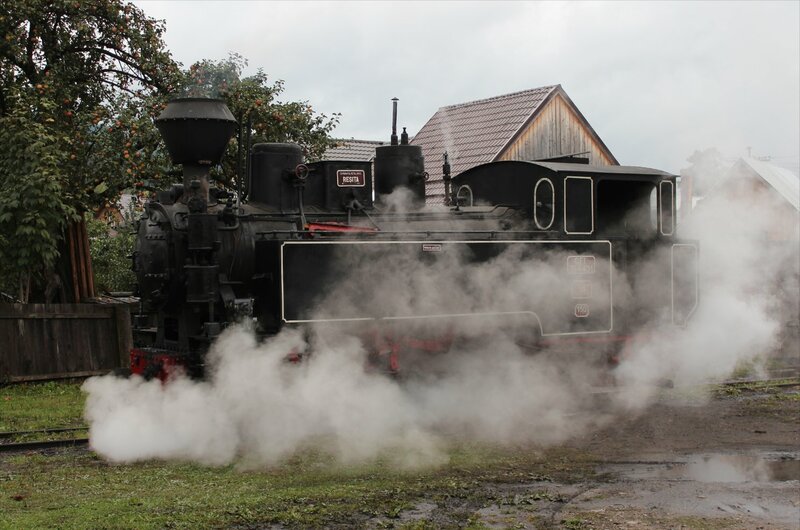 A second loco, 764-431 (Resita, 1957), was under steam in readiness for another group who would be following us up the line later in the day. 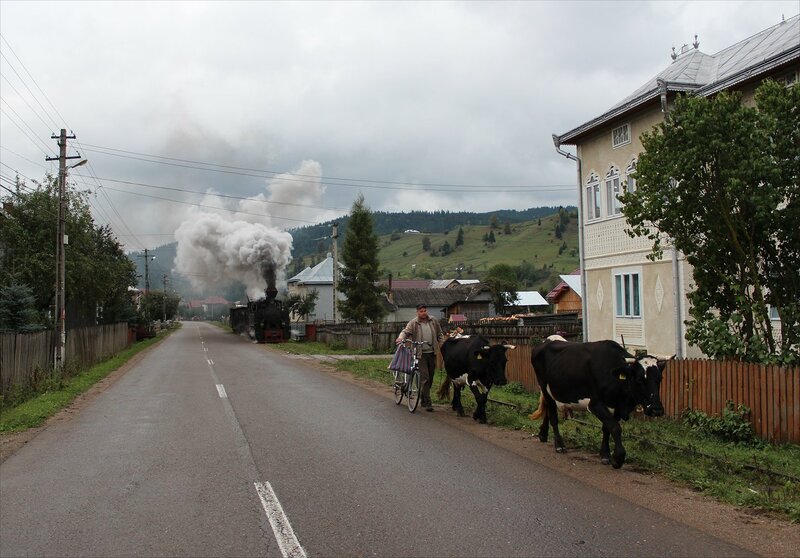 We set off from the depot Moldoviţa just after 8am and soon had the quaint sight of cows being herded along the road that runs parallel to the track for most of the way. The road was paved in recent years, adding the slight complication of dodging traffic to get our shots but in other ways the scene hasn’t changed. After getting our shots we re-boarded our bus and effected a slow speed chase! 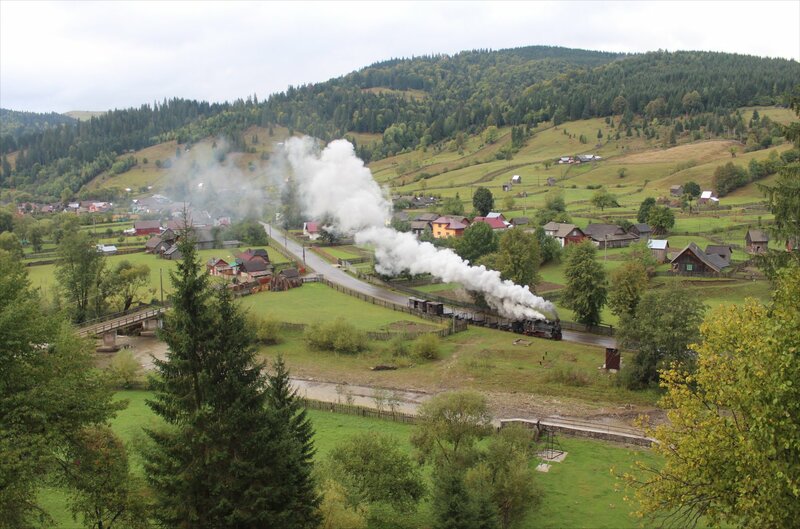 At Raşca we walked up to a hilltop position that gave an excellent view of the line and we repeated a runpast here three times in the hope that the sun would make an appearance. It was no great consolation to learn that they had 35 days of full sun and then 2 days of heavy rain before we arrived. In essence, it could have been worse or it could have been better! 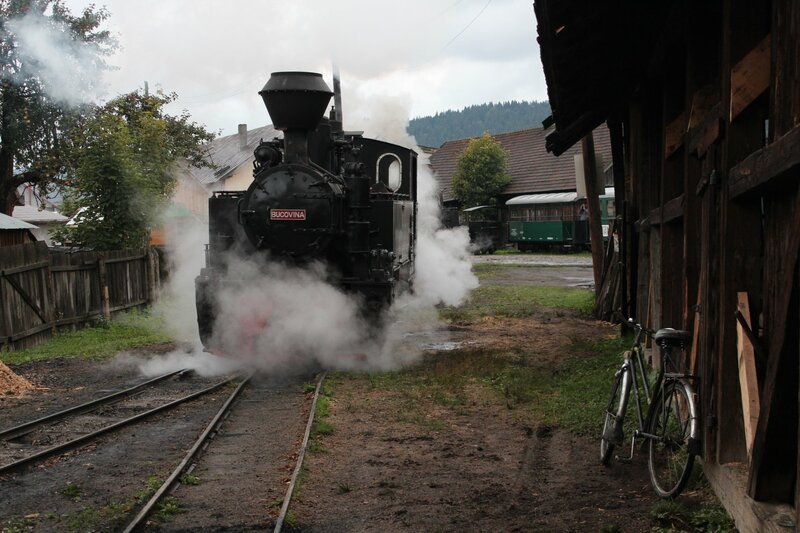 After a lunchtime stop at a hunter’s lodge (for the unlikely combination of deer, doughnuts and liqueur) we continued our run to the terminus at Argel-Zigreva. 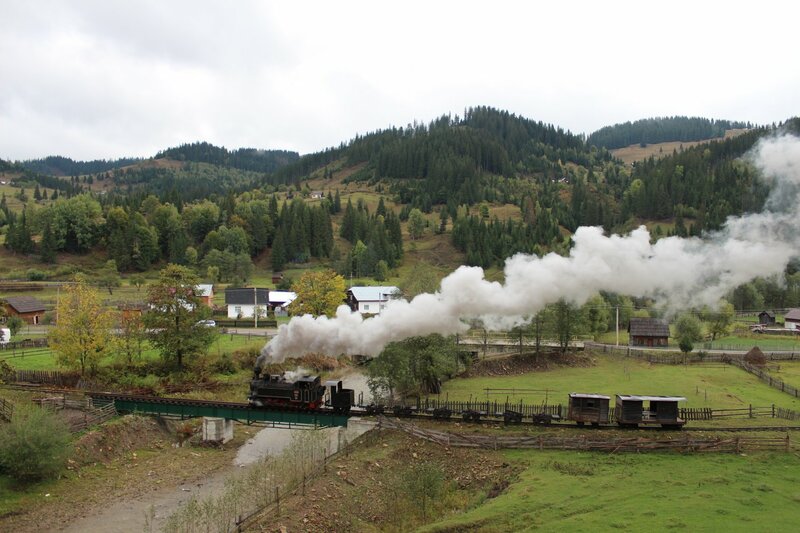 The short stretch of line packed in plenty of attractions, including shots from the hillside looking down on the bridge over the Moldoviţa and a woodcutter’s yard. The woodcutter looked slightly baffled at the horde of photographers that descended upon him but happily played along with our request for him to keep chopping as our loco pased by! My reluctant camera added some unwanted excitement to the dat by failing to fire at some stops, but hopefully the shots I managed to get show why this is such a delightful stretch of line. I hope this line has a good future ahead of it. 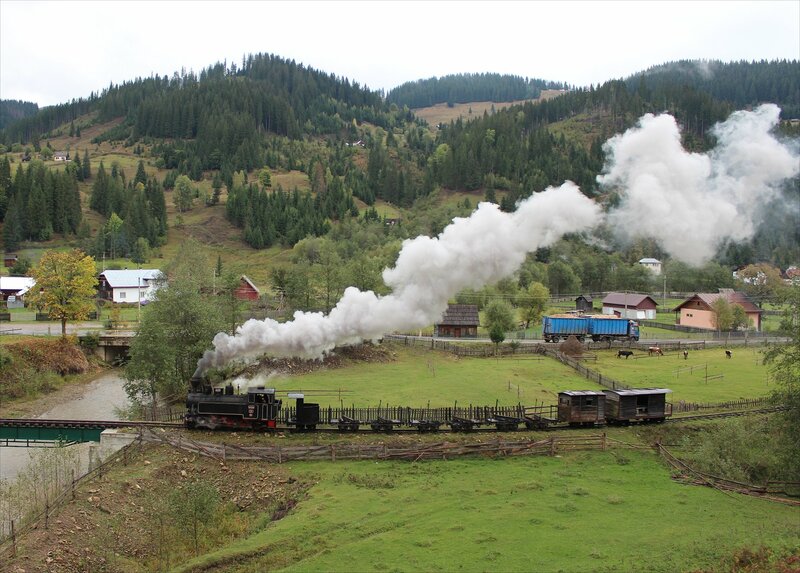 Unlike many other lines it has the added draw of the Mânăstirea Moldovița, a Romanian Orthodox monastery built in 1532, which is noted for the frescoes painted over the entirety of its exterior walls. 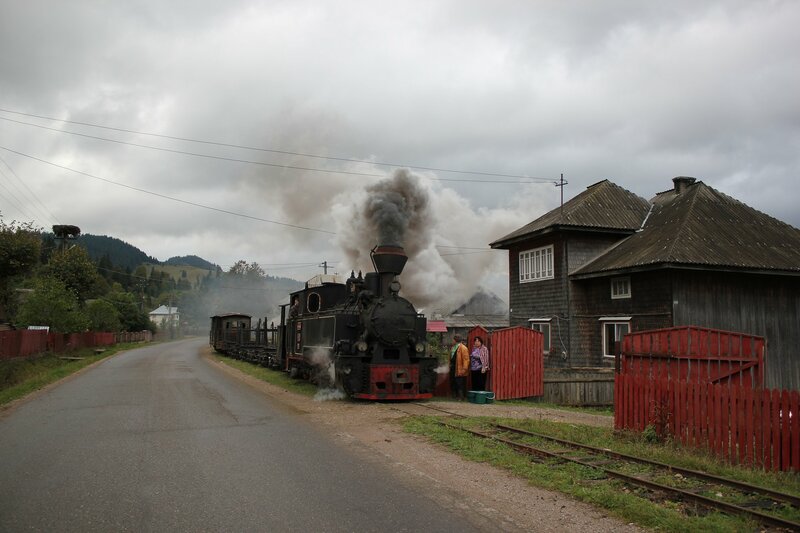 We finished our day on the line at 1.45pm and began our long drive south soon afterwards. In theory the drive ought to take around 9 hours, but with our driver it could be considerably shorter!